Inspired by the high-spirited British magpie bird, this magical wire ornament outlines the beautiful contours of a magpie feather with bold azure blues, opaque whites and glossy black colourings. The copper metal has a weathered oxidised finish and a glossy coating, all ready for hanging in the home or garden. Suited to all walls, windows and gardens, this design brings nature to life through wire art. Variation: Each piece is hand-crafted individually and will vary slightly in appearance. When ordering you will receive a replica of the original design using the same colour palette. Slight differences in the design and beading will occur due to the hand-made nature of copper metalwork. The photographs in the gallery show a number of versions of the design on multiple backgrounds to give the most true to life image. Beads: Agate, jade and quartz semi-precious gemstones. Metal: Solid copper metal with a patina finish polished to reveal the warm coppery tones beneath. The copper has been sealed with a tough clear gloss finish to retain the glossy lustre highlights. Hang: Looped metal flex wire. Approx Height: 23cm / 9 inches. Feather Meaning: Here in Britain we salute magpies by saying “‘’Good morning Mr Magpie, I hope your family are well” as often magpies are seen as a bad omen. I think this gives a bad impression of what really is a beautiful inquisitive British bird. The magpie feather can also be associated with communication, flamboyance, intelligence, expression, illumination, witchcraft and magic. Stone Meaning: Agate is a translucent microcrystalline quartz and is related to balancing yin yang in the body, protection, strength, courage, calmness and healing. Agate also helps the eyes, uterus and stomach, pancreas and cleanses the lymph system. After Care: Please note I am a delicate ornament, the copper is work-hardened, however if you sit on me or handle me roughly I will get squashed. This is not a toy. Inspired by the beautiful British green woodpecker, this hanging decoration captures the vibrant plumage that begin with crimson red at the top of the head, through pale yellow, deep green and black along the wing tip. A regular sight and sound over the British Isles, with a distinctive laughing call. The copper wire outlines the bold contours of the woodpecker feather, all wrapped with bright coloured gemstones. To adorn walls, windows and gardens all year round. Inspired by the graceful swan, this pretty white tail feather is adorned with agate and Czech glass beads. This hanging decoration is inspired by the beauty of the swan, a familiar sight at our lakes and rivers. This translucent suncatcher may be hung on your wall, in your window or out in the garden for year round sparkles. Each of our feather designs outlines the pretty contours with minimal copper wire-work that brings nature to life. Inspired by the beautiful British brown owl, this majestic feather decoration is wrapped with earthy tones of brown and cream agate semi-precious gem stones. This designs captures the soft and muted colours of the brown owl with a bold wire outline. The raw copper metal has been given a weathered oxidised finish and a glossy coating, all ready for hanging in the home or garden. Suited to all walls, windows and gardens, this design brings nature to life through wire art. A decorative copper butterfly suncatcher with honey quartz, agate, glass and jasper beads. This pretty window decoration is inspired by a woodland scene of gnarled tree branches, blossoming leaves and a summer butterfly. Featuring contrasting colours of metallic coppery tones with watery greens, soft pinks, vibrant red and warm honey glows. Suitable for hanging in the home as a wall decoration, in the window to catch the suns rays or outdoors for year round colour as a lovely piece of metal garden art. This framed suncatcher features a vibrant orange and red butterfly hand-made with copper wire work and adorned with agate, carnelian and glass beads. The design draws inspiration from a late summer riverside scene, where a butterfly is in full bloom and dances in and out of the sun’s rays streaming down into the water. For those who dream of the living by the ocean. 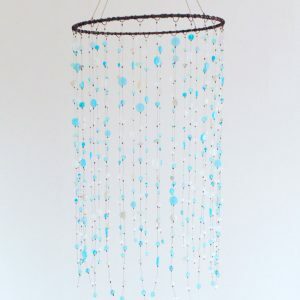 This pretty beaded hanging mobile is adorned with glass and gemstones, with a soft blue, aqua and white sea shore colour palette. This design is for hanging in your coastal home or to celebrate the birth of a baby boy for his soft blue nursery room. A patina copper wire wrapped red berry design with agate and carnelian beads. This decorative window hanging ornament is suitable for both the home and garden. Hang in your window to see warm flashes of dancing light in sunshine or add some year round colour to your garden. Inspired by harvest time and ripe summer berries, with rich and vibrant tones of reds and oranges set against the dappled coppery highlights. This spring time hanging decoration features a woodland scene, with mid-century inspired trees that are sprinkled with pink and green gemstone and Czech glass beads. The trees are rooted onto a piece of Isle of Wight driftwood. This beach hut hanging decoration is inspired by woodland faery doors, that open into a magical miniature world. 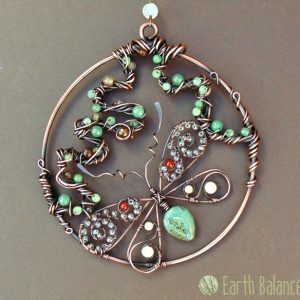 The design is handmade with copper wire work and adorned with gemstones and glass. 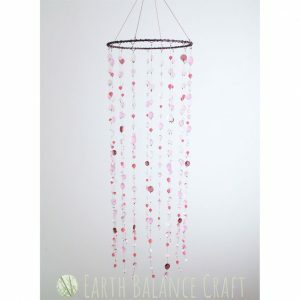 This dusky pink and soft white hanging mobile is inspired by sakura season, when falling blossom petals float in the sky like nature’s confetti. The hand-made design is adorned with a soft and gentle colour palette of semi-precious gemstones and glass beads that love to glow in the sunshine. One of my favourite British garden birds, is the blackbird, a regular site in my garden chirping away and bobbing along. This copper wire hanging decoration outlines the plump shape of the blackbird, with it’s round tummy, distinctive head shape and signature black and brown colourings. The design is made with a minimal wire-work feel and can be hung as wall art or as a window decoration. This is part of a collection which celebrates the beauty of British birds, with a variety of nature inspired decorations for the home.